Whilst on site completing fire door remedial work at a top Knightsbridge Hotel we were asked to refurbish the final exit doors. Needless to say the standard was impeccably high and the client very pleased. 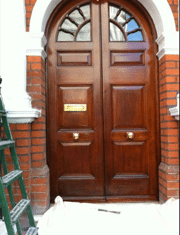 You can find out more about our fire door services by clicking here. 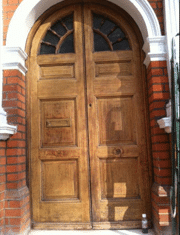 This entry was posted in Building Safety, Fire Doors, MJ Fire Safety, Protection. Bookmark the permalink. HIRING NOW – PASSIVE FIRE ENGINEER & ADMINISTRATOR WANTED! HIRING NOW – DRY RISER, EXT & SIGNAGE ENGINEER WANTED! Copyright 2019 © MJ Fire Safety. Website created by ThreeSixty Web Design.